Safety Net wishes to express its genuine appreciation to Marc Wright and Tommy Goran for attending the Safety Net Board of Directors meeting on December 18, 2017. 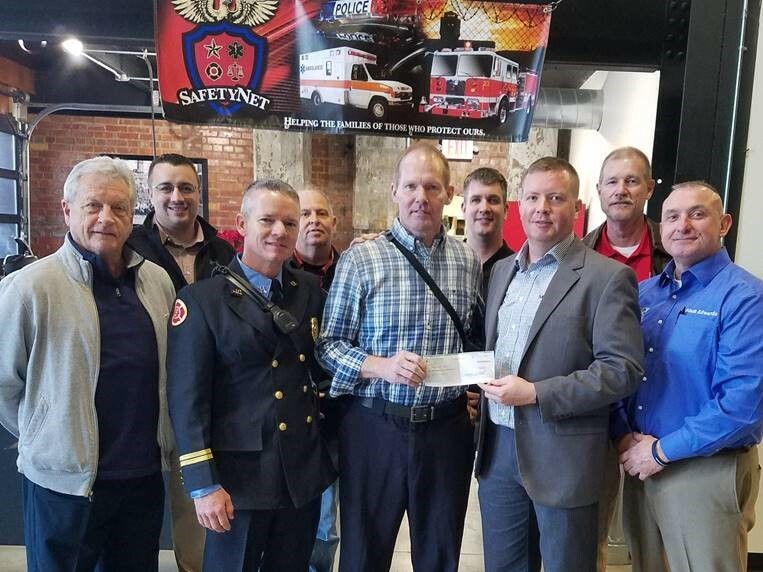 Marc provided Safety Net with a generous donation of $5,000, of which 100 percent will go to survivors of future officers and first responders who perish in the line of duty. A few close firefighter friends of Marc’s were able to make one of his dreams come true through the Marc Wright Cancer Benefit. Marc had always wanted to visit NYC and do a ride-along with FDNY’s Rescue-1. He also wanted to pay a visit to the 9/11 Memorial while in NYC. He was able to do both as a result of the wonderful fundraising efforts of his supporters and shared his New York experiences with Safety Net’s board members. Marc requested that any funds raised above the amount needed for his trip be donated to the Firefighter Cancer Support Network, Safety Net of Missouri, and St. Jude’s. Safety Net cannot begin to express its appreciation to all those who support Marc and for the contributions that made his dream become a reality, nor can we thank Marc enough for his generous support for our organization.